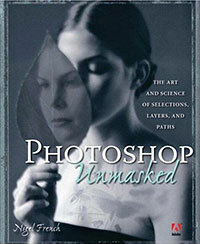 I love books that inspire you to explore Photoshop in new ways, and Adobe Photoshop Unmasked, from Nigel French, does just that. It ignites curiosity and guides you through mastering Photoshop by understanding layers. The book's 6 chapters  Selections, Channels, Layers, Layer Masks, Adjustment Layers, and Channel Masking  are arranged in order of complexity, and many of the step-by-steps in the book include files (downloadable from a website) that you can use to work along with. When it comes to Photoshop selections and channels, Nigel is a top expert, so you're in good hands with him as a guide and a teacher, and the book is packed with so many useful tips and advice that it serves as a solid reference to have on your desk. Layers, channels, paths, clipping masks, layer masks, vector masks, the Pen tool, Magic Wand, and so on  all let users work on specific regions of an image, but in fundamentally different ways. Making clean, efficient selections are essential skills for any Photoshop user, whether a graphic designer, professional photographer, or hobbyist. Graphic designer, teacher, and Photoshop expert Nigel French saves you hours of frustration by illuminating the best selection tools and techniques for specific tasks, and the most flexible approaches to correcting and editing images in Photoshop. Using step-by-step examples, this book clarifies often-misunderstood selection methods, shows which masks best select a range of tone or color, and demonstrates how the right tools and techniques can help transform even the most mediocre picture into a polished image, saving you hours of time. Nigel French lives in Brighton, England, where he works as a graphic designer and trainer. He is the author of InDesign Type: Professional Typography with InDesign CS2 and the former director of the Graphic and Interactive Design program at UC Berkeley Extension in San Francisco.